Worship Service 9:30-11:00 am. Kingdom Kids group 9:45-10:15 am. Pancake breakfast 11:00 am-12 pm. Small Group Wednesday evenings, click this small groups link for details. 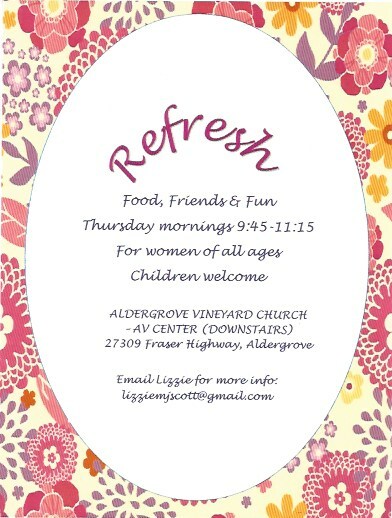 Women of all ages, come and REFRESH! 6:00-7:30 pm Pre-Teen (grades 4-7) gathering for games, devotion time, worship, & snacks. Come and join us upstairs at the AV Centre. You’ll find upcoming dates in the Church Calendar (What’s on).